Models are no strangers to the power of transformation: During New York Fashion Week, one may hop from bleached eyebrows and a sleek ponytail at Alexander Wang to sultry, smoky eyes and Bardot-esque bedroom hair at Diane von Furstenberg. Playing multiple roles is all part of the job — and the right beauty look helps them do it well. So, it's no wonder that the savviest catwalkers understand the importance of a good haircut or color. After all, wasn't it Karlie Kloss' now-ubiquitous chop by Garren that catapulted her into iconic territory? And, wasn't it Soo Joo Park's icy-platinum hue that made her go from model-on-the-rise to Chanel campaign girl? It's no surprise, either, that the city's salons were flooded during the days leading up to Fashion Week. Sure, some girls were just there for a trim or touch-up, but others were trying to invigorate their look in a more buzzworthy way. We found nine beautiful models who invested in everything from My Little Pony colors to blunt bangs, completely changing up their styles before hitting the runways. Click through to check out their makeovers. "I've always been an outgoing Southern girl," says Alex of Trump Models, who just made a splash on the runway at BCBG. "But, the hot Texas sun always turns my hair a bit yellow! When I arrived in New York City, my agents thought I was ready for a change." Enter Aura Friedman, the Sally Hershberger colorist who's known as something of a model whisperer. "Alex's hair needed correcting, since she had very brassy roots," she explains. "So, I wanted to even out her color, but then I decided to add a soft-pink hue to complement her skin." So far, it looks like the new 'do suits the Southern belle just fine. "It gets a lot of attention," she says. "And, it makes my blue eyes pop. I just stand out more!" The subtle wash of pink is a great way to freshen up platinum, which has quickly become the hair color of the moment. The only downside? It rinses out quickly. Friedman recommends mixing Manic Panic with a deep conditioner to touch up at home. Check out director Marissa Kaiser's video of the transformation below. "It's always great to have a fresh, new look every season," says Brazilian beauty Carolina Thaler of Elite Models. "Clients always like to see something new and fresh, but it's also a way to show that you're developing as a professional." Since this wasn't Carolina's first time on the runway, a dramatic change wasn't exactly what she was going for. "The chop was all Carolina's idea," insists Ryan Mitchell of Cutler Salon, who gave the model her long bob. "She was such a dream: She came in with photos of Daria Werbowy and a really clear idea of what she wanted to do. Plus, bringing the length to the collar bone is a great idea for fine textures, since it creates the illusion of fuller, thicker hair." And, if you're thinking length doesn't matter, Mitchell suggests you think again. "Backstage, models with short cuts usually don't get the same styles as the girls with longer hair," he explains. "Designers or stylists may decide to leave the hair as is and go in a totally different direction." That's a major playing-field advantage for a hopeful who wants to stand out among an army of sleek ponytails. "Hair is one of those easy things that makes you feel more comfortable in your own skin," says Marina Krtinic of Women Management. "When it matches your personality, the results speak for themselves." While Marina had a gorgeous head of covetable, long, ginger hair, it wasn't exactly "her." After a dramatic chop with blunt bangs and a color overhaul (plus, a piercing or two), Marina felt a lot more like herself. "Her features are so dominant, so we wanted those to stand out, and not just her red hair," says Roxie Darling of Hairstory. "And, I think the ginger, while beautiful, felt a little commercial. This new, rich dark brown is much more editorial, and it's more fitting for where her career is headed." But, the new 'do wasn't just for the job, Marina insists. "It feels like a more elevated version of myself," she says. "It shows off my personality so much better." While Marina was getting rid of her red, Zella Christenson of Trump Models was simply modifying hers. "I've always had auburn hair, but when I arrived to New York from Colorado, my agents and I discussed an update." Few colorists know red — and all its nuances — better than Friedman. "We wanted a stronger color, so we went with a rich, dark copper. Zella is so sweet and charming, but we wanted to give her more of a bold edge." Consider that mission accomplished. "The new color makes a difference with how I present myself," Zella says. "I changed my hair, and I've developed a whole new sense of style since moving to New York." Now, she's ready for her very first Fashion Week. Cool-girl Brandee Brown has already made quite a splash on the scene, earning a coveted spot on the DKNY runway. "I wanted to change my color, but I really didn't know exactly what to do," she told us backstage. "The minute I sat in Aura's chair, I knew I was in good hands. I told her I was ready for a transformation, and she came up with the solution. I totally trusted her." Aura was thinking pink. "Brandee needed a color that matched her vibrant personality," she says. (And, judging by the model's Instagram shots, that's a pretty tall order. This girl is a whole lot of personality, which is probably why we are infatuated with her.) "The pink makes a statement, but it also brings out subtle tones in her light eyes." "It's perfect," Brandee says of the new shade. "I absolutely love it, and it feels totally right for me." We'd have to agree — Brandee was born to have as cotton-candy-hued coiff. Check out her new look in all its glory in the video below. It's been quite the hair year for Frida Aasen of Women Management. "I've been blonde, black, and back to natural," she says. "So, before Fashion Week, I just wanted to feel confident in the tone and the cut." The solution? 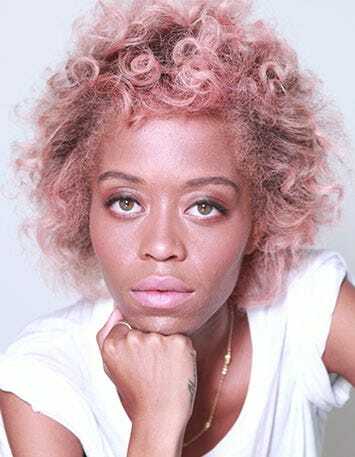 Hairstory's Darling brought her "warm, sunny blonde to a cooler beige tone," while Wes Sharpton gave her a sultry style that "lends a sensuality to her face." "Frida's features are subtle, so the bleach-blonde was a little overpowering," Darling explains. "Softer, wheatier shades of blonde look more mature and refined. She's growing into herself as a woman — both personally and professionally — so, I think this color reflects that." Meanwhile, Sharpton's cut frames her face in a style that's almost Claudia Schiffer-reminiscent. "Initially, she was terrified," he says with a laugh. "But, she looks more modern! She loved it after we were finished." Courtney Shallcross of Muse had already undergone quite the transformation: She took the plunge into platinum, so her career could grow in an edgier direction. "It was fun for awhile, but it was also limiting in the kind of work I could get," she says. "But, I've been a blonde my whole life! So, I wanted to stay that way." "The new shade is just so much more versatile," says Courtney. "Plus, it's nice to know that my hair is in healthier shape! I was stressed before, because I felt like my hair was dying a slow, painful death. Now, going into the madness of the shows, I feel more confident." 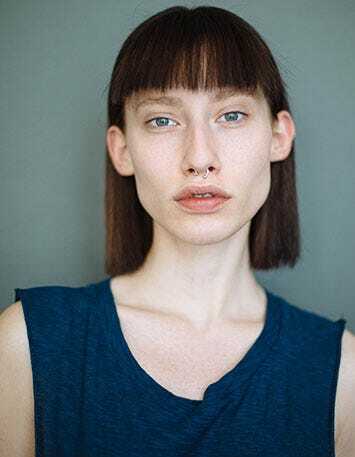 Hannah Vandermolen of Trump Models is no stranger to out-of-the-box hues: She's been rocking an unapologetic emerald green for quite some time. "There's a lot of primping and preparing that goes into getting us ready for Fashion Week," she says. "And, many of us feel a pressure to fit a certain image in order to impress casting directors or designers. But, I spoke with my agency, and we all agreed that it's best for me to present myself as the punky girl that I am." In the true spirit of punk, Hannah was ready for another round of reinvention right before the castings started. "Hannah is always fun!" Aura says. "She pretty much will go for whatever, but we felt that the steel gray with blue tones would be a lot of fun for the spring shows." "Having such a bold color is a risk," Hannah admits. "But, it makes me feel way more confident. And, this new look is really awesome. I feel like I just stepped out of a Dead Kennedys concert wearing a Dior dress." Daria Osipova of Trump Models didn't even know she was getting her hair overhauled. "I arrived late to Fashion Week," she explains. "But, I knew about Aura and all her great work, so I really trusted her." Let's consider this proof that surprises can be a good thing — a very good thing. "I didn't want to do anything too drastic, but adding a punch and vibrancy to her natural hair color just helps her stand out more," Aura explains. "This is only my second Fashion Week," Daria says. "And, while I was surprised about the color at first, casting directors have taken notice of it and pointed it out to me. I definitely feel more confident! I've even been taking more selfies." Check out the stop-motion video of her transformation below.